This is annoying. 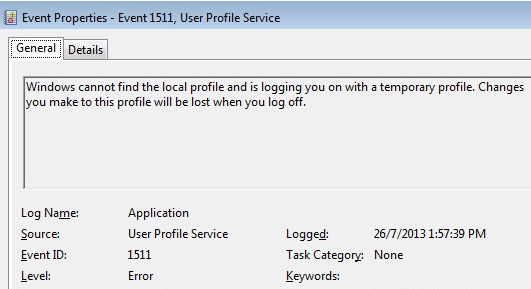 My domain-joined Windows 7 machine kept showing this error upon login and I couldn't save any new profile. Initially, I thought my roaming profile was corrupted. But re-building the profile did not solve the problem. The same error still appear until I saw this Microsoft KB post. Instead of just removing the sid.bak records, I removed all user registry records. In effect, it would force a rebuild of all local user profiles that would be synced from the central user profiles on the network share. By default, only Domain Admins are able to create and manage Certificate Templates on the Active Directory. To delegate to other groups (e.g. 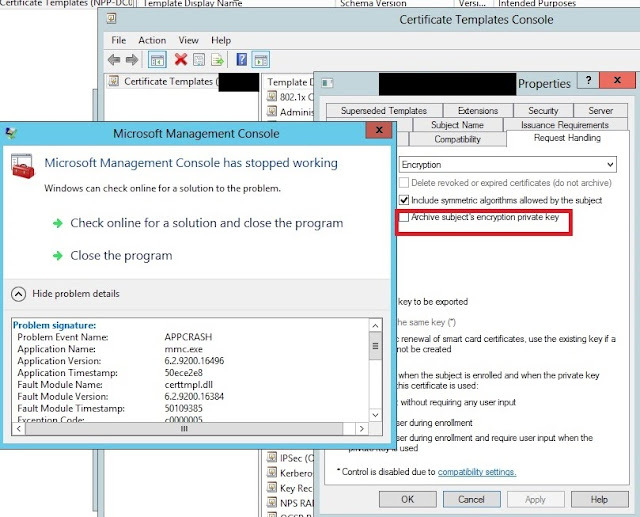 CA admins), follow this guide on Allowing the Creation and Modification of any Certificate Template. Cert Template MMC (CertTmpl.msc) on WS2012 crashed whenever the archive key check-box was enabled as shown in red box below. 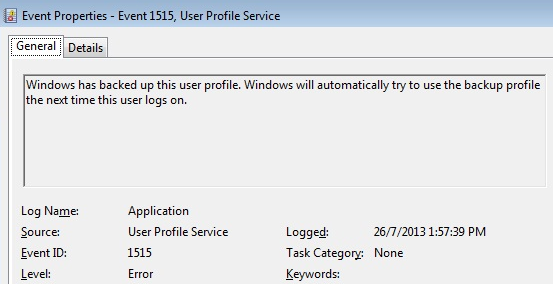 A technical support was raised to Microsoft premium support with TTTrace.exe debugging tool. Eventually, the support team replied that the crash was due to a recently added CA server did not return any cert template information. Indeed, after I issued a cert template on that CA server, the crash issue was gone. Nice random password generator for AD user account creation or reset. It's a Powershell script (Get-RandomString.ps1) available on Generating Random Passwords in PowerShell. If you need to reset the password of an AD user account, there is another script (AD_Password_reset_v1.0.ps1) that uses this random password generator. Agent installation failed copying C:\Program Files\Microsoft System Center 2012\Virtual Machine Manager\agents\Amd64\3.1.6011.0\vmmAgent.msi to \\HyperVHost\ADMIN$\vmmAgent.msi. Hence, I attempted to perform a manual installation. On the Hyper-V host, I copied the agent installation files from the VMM server "\\VMMServer\C$\Program Files\Microsoft System Center 2012\Virtual Machine Manager\agents\Amd64" to a temp folder. Step 2: Install vmmAgent.msi by double-clicking on it. Installation ended prematurely due to an error. Retry step 2: Install vmmAgent.msi using elevated command prompt: msiexec vmmAgent.msi. Installation completed successfully. I was attempting the step-by-step guide for sysprepping SQL Server 2008R2 in my gold VM image on SCVMM2012. After successfully created a VM template out of this image, the Complete SQL wizard couldn't get a service to start. I noticed the failure was due to the SQL Reporting Service. Restart the server and the reporting service should be able to start up correctly. I went back to my gold VM and pre-created this registry setting.